I saw an article in the Sunday Times that featured a blog devoted to describing and celebrating the style and fashion sense of older adults. The photographer and blogger, Ari Seth Cohen, 29, is joined by a small group of contributors including his father, Jack, 61 and others. 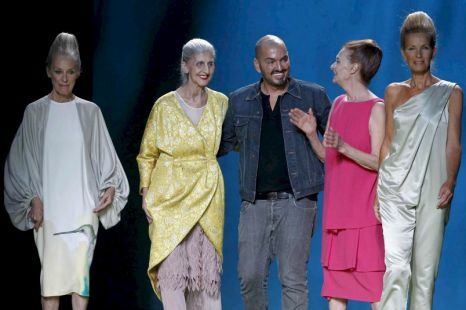 Inspired by his grandmother, who always treated him with respect, Ari now “treat[s] older people as legitimate sources of sartorial inspiration.” He understands that clothing still remains for the 60 something, a source of self-definition. We retain, for better, or worse the sense that the right outfit can lift us up, fight depression, engage the viewer and more. Choosing the right outfit for the first day of high school, the interview, the professional lunch, the son-in-law’s tenure reception or the donor dinner will continue to be a matter of serious consideration. http://www.advancedstyle.blogspot.com/. To offer promise of a different me. When I buy new clothes, I buy success! Lasts until the bills come due. What an interesting blog! And why aren’t people like me all over this? As another over 60 blogger, I hope you’ll continue. More from you please. Thanks so much for commenting on my blog. You inspired me to get going on it once again. I enjoyed reading your blog; I have the unique gift of never, ever being able to find something I want to wear in a second hand shop or on sale. Very sad. If I shop with my ultra-cool friends and they urge me to buy something, I do. But I never wear it. Maybe your blog will provide the retail therapy I need. Looking forward to following you and staying vibrant in my fashion choices. Cool blog. Good for you.